Van Gerwen made a storming start to his 2018 Premier League campaign with a 7-2 win against Rob Cross. It was a very high-quality performance from Van Gerwen which included three checkouts of 114. The final match average of 100.8 from Van Gerwen wasn’t high by his standards, but a main point to note from his performance was the pressure from Van Gerwen when Cross was throwing first; it was relentless, and the world number one twice broke the Cross throw with 11-dart winning legs. Mighty Mike enjoyed good success last weekend with two tournament wins in the UK Open qualifiers (his tournament win on Friday included a victory over Peter Wright). Overall, last weekend he won 18 consecutive matches before losing to Michael Smith in the quarter-finals of the Sunday tournament. Peter Wright squandered leads of 5-1 and 6-3 against Gerwyn Price last week and had to settle for a 6-6 draw in his opening match of the 2018 Premier League. Wright missed a total of four match darts which would have given him the two points. The overall performance of Wright against Price wasn’t impressive, perhaps due to his experimentation with a different set of darts. His average of 92.93 was the third lowest on the night and he hit under 29% of his double attempts. 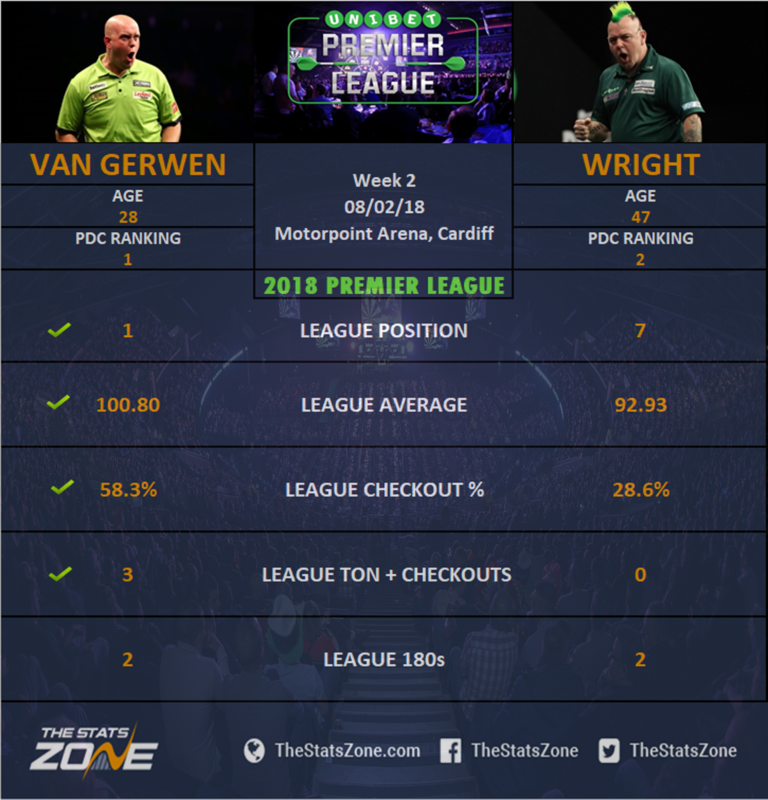 At last weekend’s UK Open qualifiers, Wright had runs to the semi-finals on Friday and on Saturday where he lost to Michael Smith and Michael van Gerwen respectively, whilst he lost in the first round on Sunday. This is a repeat of the 2017 Premier League final where Peter Wright missed opportunities to defeat Michael van Gerwen and was duly punished. They have met many times over recent years with Van Gerwen enjoying a lot of dominance even though they have played out many close matches. Peter Wright’s recent performances do not suggest he will come close to toppling Van Gerwen in this encounter. The Green Machine is looking in imperious form and will make it two wins out of two in the 2018 Premier League with a win here.